My husband and I signed up for a 10-day organized tour of Turkey. I immediately checked to see if there was a Pack for a Purpose destination and found it in Istanbul. I assumed we would have some free time to make the connection. We asked our guide how to get from our hotel across town to The Ritz-Carlton which supports a rural school.He told us to take the metro and drew us a map. Now would be a good time to mention that we don’t speak Turkish and the only available time before we left Istanbul was on the sabbath when EVERYONE was on the metro. People were amazingly helpful and we made it without incident. Our fellow metro riders helped us squeeze on the train and kept us from tipping over when the doors opened. It was a great way to handle April’s #60for60. I turned 60 in November and am donating 60 something’s each month. 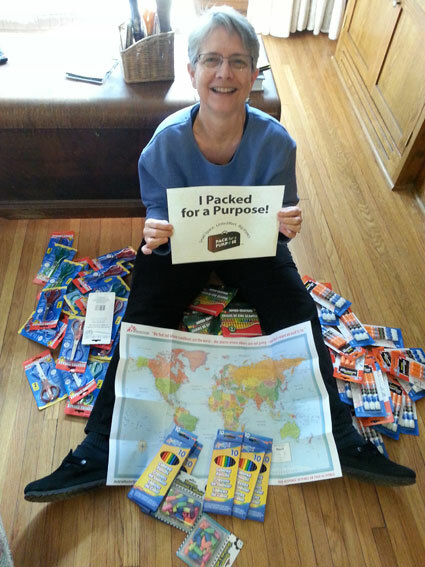 The Turkey schools got 60 scissors, glue sticks, crayons, pencils, and erasers and we got a great travel memory.